A frequently unexpected side effect, electric shocks are symptomatic of two significant parts of many women's life: pregnancy and menopause. However, they are experienced in different ways and have different causes. 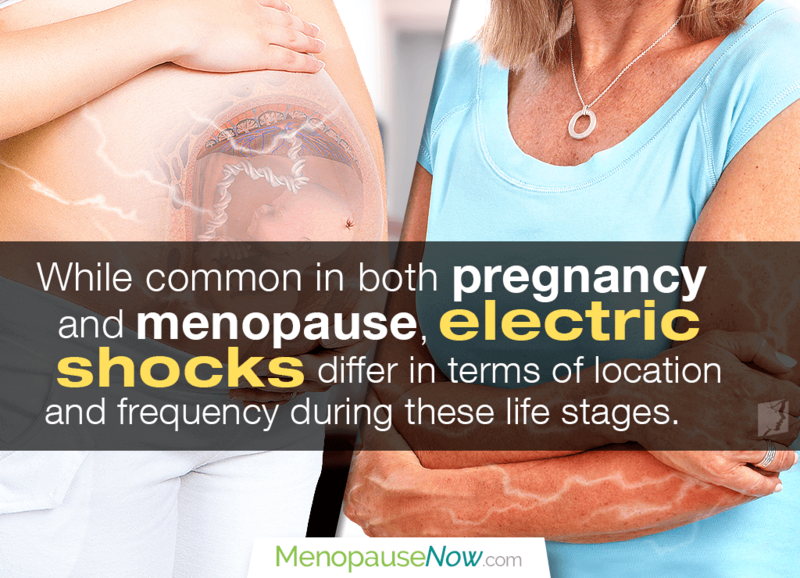 Find out the difference between electric shocks during pregnancy and menopause here. Depending on what phase a women is experiencing, the most likely cause of electric shock sensation will differ, but both stages of life have hormonal imbalance as the most important physical change. One of the less common symptoms felt during those nine months is electric shocks.The hormonal changes of pregnancy can play all kinds of crazy tricks on your body, including electric shocks, and you will want to avoid them. During pregnancy, they can come as a surprise. As the fetus grows, uterine stretching to accommodate its larger size may result in this sensation. Menopausal women may be experiencing electric shock due to hormonal changes. During menopause, the body produces less estrogen, and estrogen plays a complex role in the nervous system, so changes in estrogen levels could lead to electric shock sensations. Electric shocks in pregnancy tend to occur around the areas of greatest stress - namely, in the abdomen and around the uterus. Though this may differ between women, many report the feeling to occur deeper within the body, as opposed to on top or right underneath the skin. Some women notice and odd buzzing sensation - like either a mild electric shock. This occurs a your baby raises and lowers her head against your pelvic floor muscles. The fetus directly impact by pressing on a nerve or stepping down on the pelvis or cervix. Menopausal women tend to report feeling electric shock sensations in the arms, hands, legs, and feet. Unlike electric shocks in pregnancy, they are often felt close to the surface of the skin, whether prickling or in surges. The number of times that women experience electric shocks during pregnancy varies depending on genetics and experiences, but episodes usually come in combination with moving a certain way, like lying on one side. However, these sensations are mostly limited to the third trimester of the pregnancy, so they are overall less frequent than their menopausal counterparts. During menopause, there is a less clear picture of when electric shocks will be felt. Electric shock sensations may be connected to other menopausal symptoms such as dizziness,and incontinence in severe cases, but more research needs to be done on the topic to be fully understood. No matter what stage of life a woman finds herself in, electric shocks don't have to interfere with her normal routine or alter her quality of life. With a balanced diet, regular exercise routine, and natural herbal supplements, you can make this chronic sensation a distant memory. Continue reading to learn more about the different approaches for electric shocks. Women during menopause are susceptible to electric shock sensation. Click on the following link to read more about treatments for electric shock. For women with menopausal electric shocks, the most common location for them are arms and head. Keep reading to learn how to treat them. Electric shocks may be fleeting, but that doesn't make them less uncomfortable. Learn more about how to manage them here.